9/29 The last nest hatches! · DeBordieu & Hobcaw S.C.U.T.E. 9-29 DEB18 hatched at only 50 days with about 40+ tracks counted! Middle: At only 50 days, relocated DEB18 dated 8/10 located between Walkways #5 and #6 had a major hatch last night! 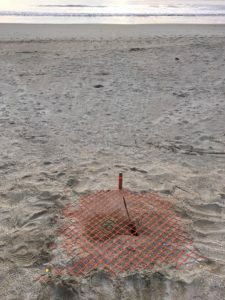 It likely occurred after high tide (10:39 p.m.) but closer to low tide (4:51 a.m.) because most of the tracks went straight all the way to the waterline. You could see where a few had been dragged by crabs:( We can also see evidence of a crab in the chamber. 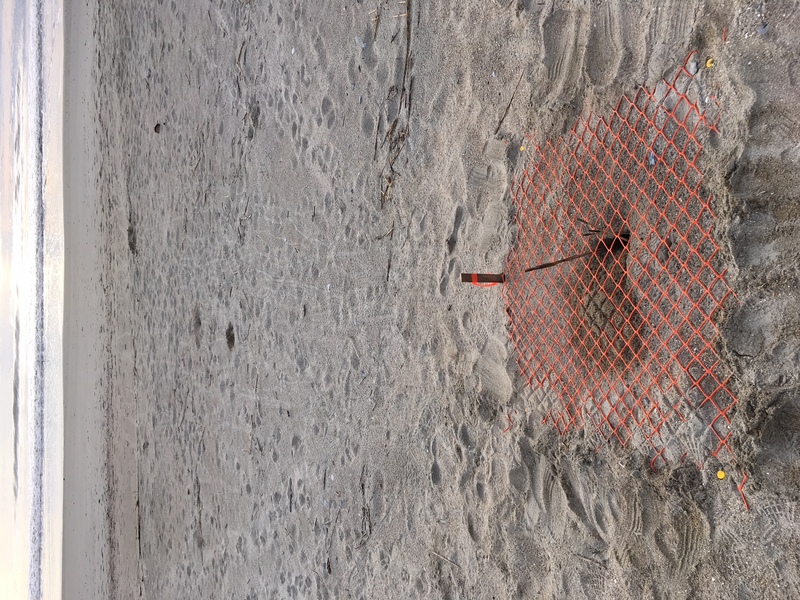 With the Beach Sweep today, we put a screen on the nest to keep people from walking on it. We will inventory this last nest Tuesday, Oct. 2 at 5:30 p.m.